One of our favorite family holidays was to Beautiful Borneo over Christmas. We spent most of our time in Kota Kinabalu, Malaysia as our port of entry to the nearby islands, and a side trip to Brunei. While no trip is perfect, Borneo is one to remember, and a place we hope to soon return. Borneo is home to some of the most beautiful beaches in the world. Just ten minutes by boat from Kota Kinabalu, Malaysia and you will be on one of the picturesque beaches with soft sands and crystal clear waters. Boats can be hired from The Jesselton Point Boat Terminal which was walking distance from our hotel (Hyatt Kota Kinabalu). Without doing any research on which island we wanted to visit (thinking there was only one nearby) we settled on Manukan Island as our boat driver convinced us it was the most popular. Prepare for a rough, wet ride in smaller boats like these. When guests arrive to the island there is a small “conservation” fee that is collected before you can enter the beach. There are a few places to eat, public restrooms, and resorts on the island. If you are not staying at one of the resorts, most boat companies leave the islands around 5pm. Lucy enjoyed a day at the beach. A true highlight for us during our stay at the Hyatt Kota Kinabalu was the Night Food Market located just across the street from the hotel. Every night the stalls would open up and put on display their fresh catches and array of local dishes. As you walk by, vendors will try to convince you to choose their stall over any of the others. We decided to shop around a little before settling on our spot and enjoying some goliath-sized prawns. Lucy enjoyed looking at all the different types of seafood and trying a few new dishes. Lucy requested lemonade, uncommon for the area. She was excited for a very special drink made just for her. Our dinner host informed us that his mother who was in charge of the drinks, had never made lemonade before and was excited to try her concoction as well. This is a busy market full of food, trinkets and clothing. Our concierge recommended we go early to avoid the heat and to not miss out as this market is only open until noon on Sundays. 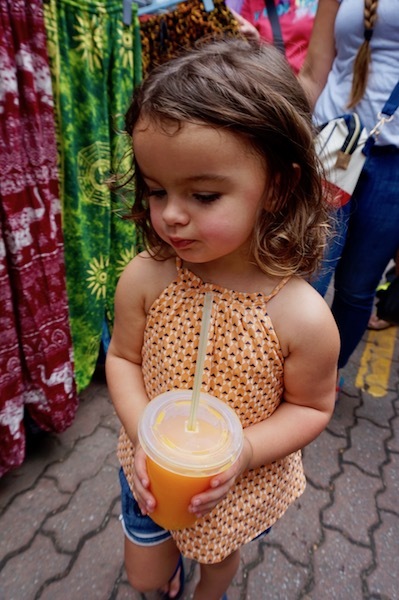 Lucy loved the fresh pressed juice, either orange or mango – we loved it too. While outdoor markets like this one are found all over Asia, Gaya had more handmade wares on offer. This was something enticing and set apart from other markets in the region. Handmade wooden toys made great souvenirs for Lucy’s cousins. Fresh juice and a bit of shopping. After booking our trip to KK it was time to look for things to do in the area. After a quick look at a map it was apparent just how close Brunei was to Kota and I decided to investigate further. We didn’t have a lot of time to spare but it seemed like a great opportunity to visit the country still ruled a Sultan. Flights were very inexpensive, frequent and took just 20 minutes on an A320 from takeoff to touch down. It was easy to book a day trip there and our family stayed for free using points at a Radisson. While we might have been able to enjoy more than a day in the Sultanate, it was plenty for our purposes and we had fun during our brief stay. The ceremonial barge outside of the White Mosque in Brunei. There are a few places to see the Orangutans in Borneo, but our hotel recommended the Sepilok Orang Utan Rehabilitation Centre which is a 40 minute flight from KK on a very small plane. We had hoped to visit this attraction but Lucy felt unwell during the latter part of our stay; we thought it was best to let her rest before our long flight home. An alternative location is at the home of the Shangri-La’s Rasa Ria resort which contains an Orangutan sanctuary on property and offers a stunning luxury experience (we will be staying here the next time we return). Borneo is just as beautiful as the travel magazines suggest it is. It has a wide array of attractions from cities like Kota Kinabalu to the islands and jungles that surround. We could have spent weeks exploring the region and I hope we will have the opportunity to return and discover more on this islands. We have a saying that we often embrace during our travels which is “Leave something to come back for” and in the case of Borneo, it was the Orangutans. Have you visited Borneo? What would you recommend seeing and doing? Thanks for the review. I’ve been thinking about visiting KK, and this helps. How are food costs in KK? While we found food to be quite affordable, it was slightly higher than other places in SE Asia. Inexpensive meals ranged from about $2-4 per meal, more formal settings around $15. At the Night Market our seafood dish of two one-pound prawns and drinks cost us about $20. What a strangely written first half of the article. Borneo is the whole land mass/island. Your visit to Kota Kinabalu meant you were specifically in Malaysia. As far as I know, Carly used the term Borneo correctly. Indeed, that is the name of the island shared by Malaysia, Indonesia, and Brunei. But she also mentions visiting Brunei. Great report Carly! Great pictures. Carly isn’t wrong at all. While residents of KK would be much more likely to say they live in Sabah, that doesn’t dismiss the fact that Sabah is located on the island of Borneo. What kind of Kids activities are there in Borneo? Love to go to exotic or secluded places like this, but often it seems like kids would get board after 3-4 days. Lucy loves the beach, and while we could go some place closer to home for a beach, it gives us something interesting to do at the same time. Riding out on the boat to Manukan island was almost as much fun for her as splashing around in the water. I also mentioned the Orangutan park that we weren’t able to visit, and there are a lot of ecological-based attractions elsewhere on the island. While we were there for about a week, Lucy was sick for a few of those days so there was less exploration than we had hoped.